I’ve avoided using the word ‘pimped’ as it implies a Max Power stuck on type approach to tinkering and adjusting your ride to reach that perfect machine. This thread over on lfgss.com really is quite a treat. 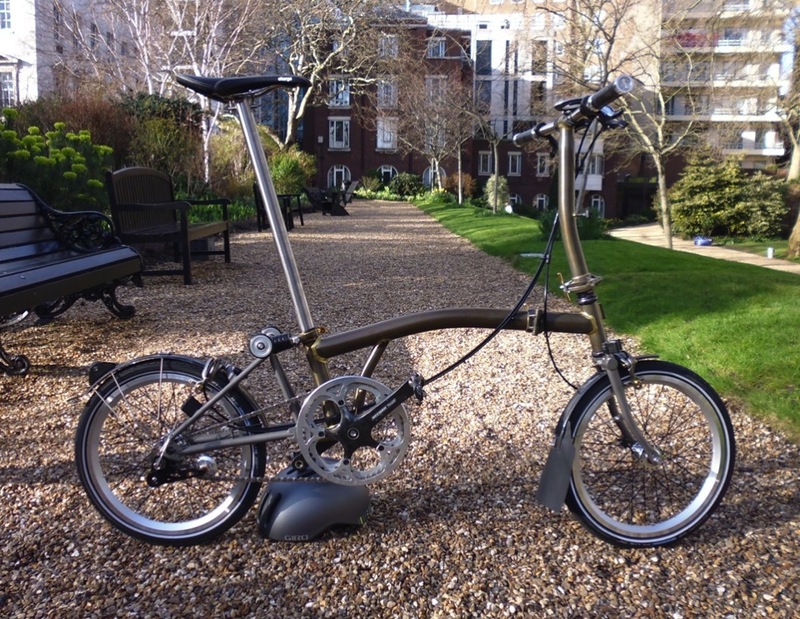 Lots of thought, and cash, has gone in to making one of the nicest looking Brompton’s I have ever seen. Having recently come to terms with my Brompton I’ve completely fallen in love with it for short trips to the station and to site. The only thing which is annoying about it is the weight of carrying it around if you ever have to switch platforms or something. This guy sought to solve that by investigating just how light you could make it through upgrades. There’s also a wealth of information in that thread about longevity of various components, tyres, axle sizes as well as some of the design decisions that went in to making the Brompton so amazing. Some nice bits include carbon mudguards, lots of Ti bolts, a Ti seat post, carbon bars and even Campag carbon cranks! The end result is pretty impressive but as ever with some of these things it is the working out that proves out clever it is. I bet it flies along! I’m in the process of selling my white Brompton so I can get the clear lacquered S3L. It’s pretty tempting to go down some of the routes that he has done. A Ti seat post & Carbon bars wouldn’t be too spendy. There’s no way I’d ever go the same extremes but it looks like there’s a couple of easy wins in terms of weight. A lovely project to see and well documented.